Ocean engineering is the branch of engineering concerned with the design, analysis, operation and planning of systems that operate in an oceanic environment. It is a field in which engineers study the ocean and sea environment in order to research how salt water affects watercraft and vessels. In other words, Ocean engineering involves intense research of the ocean and its impact on the environment and technology. Ocean Engineering is essentially another name for Offshore Engineering. It is actually a combination of several types of engineering: a mix of mechanical, electrical, civil, and chemical engineering techniques and skills, coupled with a basic understanding of how the oceans work. As Ocean Engineering is a discipline having influence from different disciplines, to undertake all these tasks the Ocean Engineer must have an understanding of many branches of engineering and must be in the forefront of high technology areas such as computer aided design and calculation. The field of ocean engineering provides an important link between the other oceanographic disciplines such as marine biology, chemical and physical oceanography, and marine geology and geophysics. The importance of working in partnerships with oceanographers from other disciplines is critical, as the challenge of working in the ocean environment requires a range of backgrounds and skills. 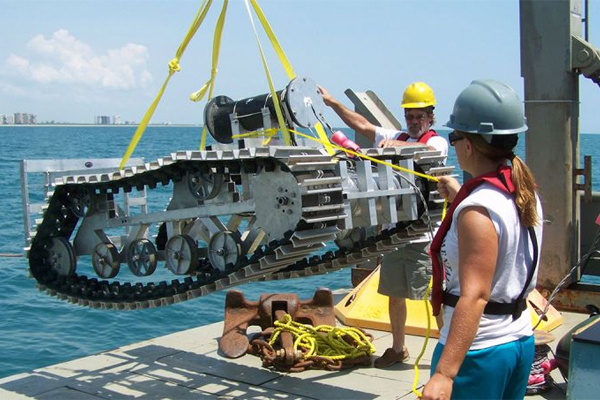 Ocean engineers design and develop marine vehicles and structures and study how technology is applied to the ocean and coastal environments. Ocean engineers are also involved with deep sea exploration and may work to design or operate ocean platforms or sub-surface vehicles. Ocean Engineers also have a specialist function in ensuring that a safe, economic and seaworthy design is produced. Naval Architecture that specializes in the design of ships and other sea - going vessels, which has traditionally been studied as a discipline in itself is a subdivision of Ocean Engineering. Therefore, the main activities involved in the discipline of Ocean Engineering and Naval Architecture are the preliminary design of the offshore structures, its detailed design, construction, trials, operation and maintenance, launching and dry - docking works etc. Ocean engineering is instrumental in helping preserve coastal structures from erosion; developing energy resources; ocean mining; offshore petroleum recovery; and protecting ports and harbors, sub sea pipelines, cables and underwater vehicles and acoustics. Areas/specialisation of Ocean Engineering: There are six main forms/ branches of ocean engineering, though most ocean engineering students will learn all aspects of the career so that they are eligible for most ocean engineering jobs as soon as they graduate from their accredited college program. Mapping the sea or ocean floor is one of the specialties. Workers spend their days designing, building, and running equipment and programs that can be used to create clear maps of the ocean floor’s landscape. This knowledge can help prevent shipwrecks caused by hitting sand bars or reefs. Hydrodynamics is a branch in which students learn how the water’s flow affects items in its way. Underwater acoustics is another specialty with ocean engineering that uses sound waves to study the ocean floor. Coastal modeling is a branch of ocean engineering in which physics and math's are used to predict the rate at which a tide or erosion is changing a coastline. Marine geomechanics study the changes of a seabed when factors like erosion, earthquakes, slope deformities, and man-made intrusions take place. Finally, offshore structures is a branch of ocean engineering where students learn how synthetic items (piers, tide breaks, sewer pipes, and oil rigs) affect the coastlines and ocean floors. By studying all of these aspects, workers can learn how to prevent damage to both the ocean and our man made vessels and structures.